Editor-in-Chief Dr. Shak Bernard Hanish, National University, USA. 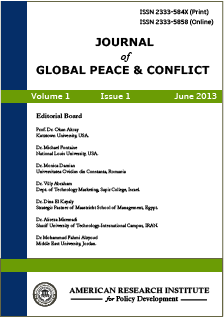 Journal of Global Peace and Conflict is double blind peer reviewed international academic journal that publishes scientific research papers on every aspect of peace and conflict studies. The journal is committed to interdisciplinary explorations of conflict resolution, peace building, humanitarian assistance, and other mechanisms that seek to prevent and control violence. The journal is also interested in articles focusing on social change and nonviolence, including such areas as sustainable development, reflective practice, action research, human rights, and intercultural relations. It provides a forum for dialogue around various ideas, assessments, recommendations, and critiques. All research articles in this journal have undergone initial editorial screen and rigorous peer review. Each paper published in Journal of Global Peace and Conflict is assigned a DOI®number, which appears beneath the author's affiliation in the published paper. Click HERE to know what is DOI (Digital Object Identifier)? Click HERE to retrieve Digital Object Identifiers (DOIs) for journal articles, books, and chapters. Dr. Shak Bernard Hanish, National University, USA. Dr. Scott Sigel, Minot State University, USA. Leslie J Nichols, Ryerson University, Canada. Dr. Menaf TURAN, Yuzuncu Yil University, Turkey. Mr. Alex Kamwaria, Kenyatta University, Nairobi (Kenya). Dr. Wan Norhasniah Wan Husin, National Defence University of Malaysia. Mr. Mahuku Darlington Ngoni, Dept. of Peace and Governance, Bindura University of Science Education, Zimbabwe. Prof. Hüsamettin İNAÇ, Dumlupinar University, Turkey. Dr. Ghazi Ismail Rababa’a, The World Islamic Sciences & Education University, Jordan.